Home › Columbia River Gorge › West Coast Wind Blog: 2017 Gorge daily fire expansion map. West Coast Wind Blog: 2017 Gorge daily fire expansion map. “Smoke on the water” is a phrase that normally brings excitement to Gorge sailors & kiters… but not this time! Below is a map I prepared using our weatherflow.com sensor data and a fire map from the Incident Management Team 2. 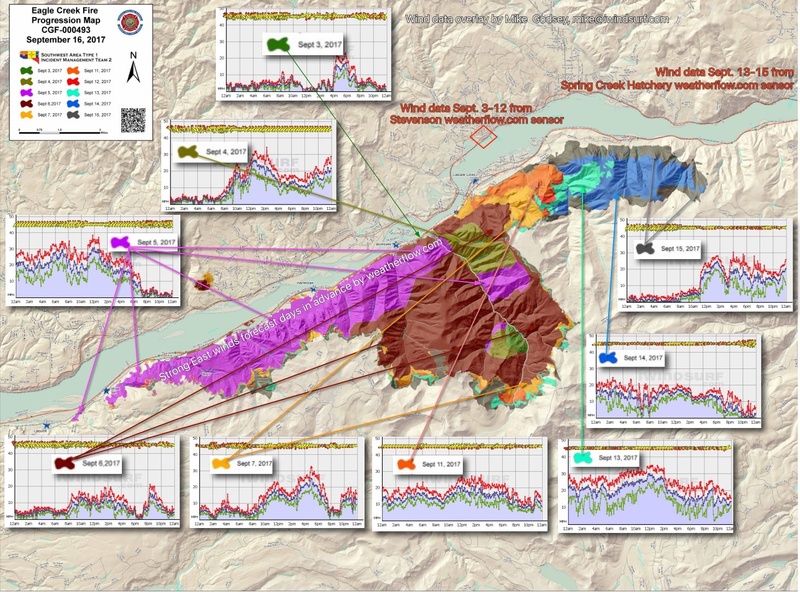 Note that the most catastrophic fire expansion happened on Sept 5. when the fire swept over 11 miles of the Gorge in 12 hours driven by winds over 30 knots between Stevenson and Rooster Rock. Click on the map for a larger version. Click on the map for a larger version.